SO MUCH God is doing in our lives right now, SO MUCH He is teaching me, SO MUCH to tell you all! I really want to share these stories in way that glorifies My Father who gave them to me, but don't seem to have enought words... So I am going to share them slowly over the next couple of days. John is a sweet, 15 year old, Karamojong boy with the most beautiful servant's heart. He lives in Masese's Karamojong area with a very old grandmother - not his own grandmother, just a woman he cares for because she is so old and unable to walk well or find food for herself - and a baby who came from... I don't know where. I am constantly humbled by his sweet disposition, his desire to help this vulnerable grandmother and child even though they are unrelated. How many 15 year old boys do you know that spend their lives serving the least of these in their own community? He is precious. Every Sunday my family eats lunch at a local restaraunt called Yummies (yea, laugh at it for a minute...) This Sunday John was waiting for us when we pulled up after church. He greeted us sweetly but then turned to show me a quarter-sized hole in the back of his foot. All we could really communicate in the little English he knows and the little Swahili I know was that a bottle had cut him. I could not figure out how a bottle made such a large, deep hole. Unfortunately, for severly malnourished children, even the smallest cut can become a gorge due to the body's inability to heal properly. While the big girls got situated inside, the little girls and I trecked of to the nearest pharmacy to pick up some antibiotic ointment, gauze and tape. After washing his foot as best we could with my bottled water, we bandaged him up good. He looked up and said, "I waited for you. I knew you would fix it." We gave John his food and sent him on his way, promising I would come back in the morning to re-bandage and start him on an antibiotic. Monday morning, he sat waiting in the place I park my van at 7 am. He was not surprised to see me. As I handed him the antibiotic, explaining how to take it. I kind of wanted him to say thank you. But as I looked in his eyes I knew why he hadn't thanked me. Because this was expected. He knew that I was going to bandage his wound and give him medicine because that is what I do. His trust was much better than a thank you. As I washed the gash and covered it with a fresh bandage, he said once again, "I knew you were coming. You bring medicine like you said. You always come." As I took his sweet face into my hands, I whispered to him that Jesus loves Him and that He will ALWAYS show up, always come, always be there to help him. 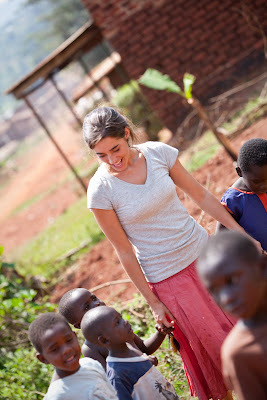 Several weeks ago, Gwen's son Elijah was looking at pictures of some sweet Ugandan children on her computer. In an effort to teach him to be thankful for all that he has, Gwen explained to him that these children were hungy, sometimes not eating for days, some having no mommy or daddy, some unable to take a bath or drink clean water. Elijah looked up at her with no doubt, "Mom, don't worry, Katie will feed them. Katie will take care of them." Over and over and over again God reminds me. I see these children's blind faith and I LONG for my faith in the Lord to be so trusting. HE WILL COME. I am waiting for Him. I KNOW that He will come and bandage my wounds and bind up my brokeness. He will always show up, just like He says, bringing the medicine, or whatever else is needed. I look at these precious children. Hundreds and thousands and Hundreds of thousands of them. Hungry, with no mommy or daddy, some unable to eat or bathe for days, never having clean water to drink, never having adequate medical care when they are hurting. Could my faith be like Elijah's? Could I look at you without a hint of doubt and say, "Don't worry. God will feed them. God will take care of them." HE IS COMING. HE IS COMING to bandage our wounds, to bind up our broken hearts, to take our faces into His hands and whisper I am always here. HE IS COMING and all these children that are hurting and hungry and longing for love are going to be scooped into His everlasting arms and told that they are beautiful. They will no longer be hungry or hurting because they will be filled with His spirit. They are the least of these, they are His heart, and He is coming for them and for us. So we wait like John. We are expectant like Elijah. We will not be put to shame. Lord, I know you will come. I know you are here. Let me bring all my wounds and brokeness to you expectantly, without a doubt. Remind me that all the children I touch, and all the children I don't, are yours. Yours in this broken life, and yours in eternity. Come, Lord Jesus. We wait in Hope. Thanks for your amazing inspiring words! God is so good to teach us through his little children! Praise the Lord that He is indeed COMING. faith like a child....beautiful stories! My son, Elijah, knows about the pictures I stare at on the computer...about my past trips to Africa and when it started raining yesterday here in Arlington Texas he said with a huge grin, "God's giving all the kids in Africa a shower" :) May these children always remain on the front of our minds and in the deepest part of our hearts! Go Katie Go, you are an angel! Thank you for being you.. and for sharing you with the world. You are the light on the lampstand...glorifying God with your good works. May He be praised, and you be lifted, held and strengthened. I am currently in Uganda, in Ntinda. Your blog always makes me want to reach for more, and serve more, and always puts my perspective where it should be. And you are right, God will hold all of these precious children in His arms. Thank you for being a light to us all! Thank you for your amazing ability to let go, and let God! I often need to be reminded that God will take care of it, not me. He IS coming, and that makes all the difference. I love this post. Thank you for sharing once again. And beautiful photos of you with the children. thank you for sharing your life with us. i am constantly encouraged & convicted when i read your blog. encouraged to love the lord with ALL my heart & convicted by the places where i withhold from Him & from others. you are a blessing to the many you know & i hope you realize that you are a blessing to the many you don't know as well! So beautiful Katie... waiting in hope; I join you! Praise God that whom we wait for is faithful, trustworthy and NEVER late. Praise him for you sweet Katie. Praise him for all the little ones he has entrusted to you and your care. Hello Katie, It is so wonderful to see another post from you and I will be patiently waiting for the others to come. John sounds like a sweetheart..What a blessing he is. I will be praying for his foot. For a fast recovery and that no infection develops. Isn't it amazing how gwen's son Elijah has so much faith in you.He knows that God is with you and that if anything can get done you are the one to do it. How awesome is that. You are making an impact all across the world. You are a blessing to so many. You dear one are a God-send. May God always keep you and bless you and use you for his purposes.Much love , big hugs and God Bless you my dear..
What a great reminder to be patient and wait for the Lord. He makes good on His promises... all the time!! 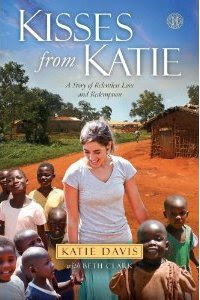 Katie, I was directed to your blog by a friend who is considering adopting from Uganda. I am utterly humbled by your devotion to the people in your community. You capture so much in your writing. God bless you! Every ONE you touch, every need you meet, every hug and smile you give, every word of encouragement you speak...matters... Because He IS coming! My heart is full of thanks for your encouragement and reminder to live in the light of eternity. I love you, Katie! I am praying for you and yours, Katie, daily!!!! Thank you for blessing us with your gift; God shines thru you, dear girl. Keep your chin up. That is so wonderful!! HE IS COMING!!! Katie, I am looking forward to the next several days...selfishly! I love reading what God is doing, how He is using you, and the endless opportunities which are available to us to be used by Him. Oh how I long to see his kingdom come. I don't know you personally but I feel like I should. I tell everyone I meet and have the opportunity to tell about you! You amaze and imspire me! You are doing such wonderful things, thanks so much for sharing with us! Oh, what a faithful God we have. Thank you, Katie, for sharing your faith. He has been showing me that I should not doubt for anything (James 1:5-8), and He will ALWAYS show up! WOW- God is always there, and what a powerful reminder to be there for others too- we are their Jesus. Thank you for all of what you do! Thank you for being Christ to so many and for letting us join your journey! Katie, my cousin sent a link to your blog to our family yesterday and I have spent several hours today laughing and crying as I read through every single post!!! WOW!!!!! What a testimony of God's faithfulness and ability to do so much when someone will simply say yes and obey Him!!! You are a blessing and an inspiration!!! "I will never leave you nor forsake you...."
He is coming, and He is here, Katie, through your beautiful, blessed hands. You are the Bible for so many, many people. May God continue to reward you richly, in this life and in the next. Thanks for the reminder Katie! Blessing to you and all of your children. Your words are so inspiring. God truly is blessing these people through you. Oh, my! How very timely was this story for me and for my whole family. Yes...we so need to say to our God, "I waited for you. I knew you would fix it." I am claiming this in our lives, especially right now, and, dear Katie, for you. You, who have taken on such a huge responsibility. How beautiful and wonderful to see the trust these precious children place in you, but what a burden it could be save for the knowledge that it is not YOU who is responsible for their needs. It is their God and Maker and Savior. You, though, are so willing to be used. You are teaching these people to trust in their God because you are proving to be so trustworthy. Our prayers are ever with you! A great reminder to me to continue to have faith that He will provide for our needs and to have the kind of faith that waits with expectancy because He loves us and knows our needs more than we do ourselves. This love surpasses my understanding and I know it is only by His grace that we can move, breath or do any work at all. Thanks so much for following Jesus and sharing. God, please comfort Katie and give her peace that You have her doing what You want her to do. And help her to trust You for the rest. Amen! Your faithfulness to the ONE who gives grace and mercy is an inspiration. Thank you for your obedience, for once again, I have come here, and I am encouraged! This post made me cry!! Thank you for serving. Thank you for taking standing up and saying, "Here I am, Lord, send me!" I am so amazed by you. THANK YOU for this post and the pictures! We are praying for you, sweet Katie! Oh what beautiful lessons they teach us! Thank you, Katie, for sharing. Thank you for all you do. You are so inspiring. I pray every day for you and your family. God bless you. "I whispered to him that Jesus loves Him and that He will ALWAYS show up, always come, always be there to help him" YES, and frequently the result will be a child's death. "there to help him" is not a promise of health and happiness, else how do you explain the thousands of children that die every week? My friends, religion is not about avoiding facts, but facing the truth (God is Truth) that the "help him" may be limited or at best achieved because there are not enough Katies to be the hands and feed of Jesus. I believe the integrity Katie showed by being at a place and a time that she promised is the foundation of all spirtuality, and keeping these promises is how we honor God. Thanks for your post and for everything you are doing. The strenght of the U.S. and all truth, is founded upon freedom of speech and a willingness to consider all viewpoints. Amizma means truth, but ultimately we risk a weakening Amazima when we selectively censor and restrict comments that may not agree with our singular beliefs. Is not any assumption that we know what God wants us to publish, similar to us playing God? An old saying is that power corrupts, and absolute power corrupts absolutely. How is selected censoring different? Yes, I know we want to protect Katie from uneeded negative comments, but at what point do we decide she is strong enough to hear a variety of comments? Maybe we need to have two blogs, one that publishes our censored version, and one that publishes all comments. The U.S. Supreme court decided the U.S. is strong enough to allow the burning of the American Flag, as its way of saying that truth can only survive if we allow all points of view to be considered. As an editor, do you claim more wisdom? I fear that you will not publish this comment, as it is too easy for those who have all edit power, to convince themselves that they are doing God's will by not publishing this post. I will watch for your decision on posting this comment. Let me know if you need my email addess or any other facts. The strenght of the U.S. and all truth, is founded upon freedom of speech and a willingness to consider all viewpoints. Amizma means truth, but ultimately we risk a weakening of Amazima when we selectively censor and restrict comments that may not agree with our singular beliefs. Is not any assumption that we know what God wants us to publish, similar to us playing God? Let me know if you need my email address or any other facts. My name is Katie (Davis) Harris and I live in Mt. Juliet,TN. I have just been reading your blog that was shared by a friend and am in awe of your stories... of your strength and determination, your spirit and faith are contagious! I have a cousin who is a priest in Uganda named Father David Baltz. I was wondering if you have ever run into him? My mother, Mary Therese Baltz is his cousin. I plan to follow and contribute to your/ His calling. You are amazing and brave. Thank you for your words...I needed to hear of blind faith today. I need to wait expectantly, knowing that God will take care of me, God hears my heart. One tip I wanted to share was the making of Saline. Two cups of water at a rolling boil for 10min. Stir with a spoon that has been boiling in the water. Pour liberally on wound to wash it out. The temptation with wounds is to use peroxide but avoid this temptation. It fizzes nice and does a great job of cleaning but also kills all the new skin cells. It's great for the first clean, but after that stick to saline. On a deepish wound that is healing, scabs are not your friend. Don't pull the out but if the wound it moist enough and covered enough they won't form. On the other hand, if the wound looks like it's been soaking in a bathtub it's too wet (macerated). Rinse the wound and leave it open to dry a bit (making sure not to walk around and get it full of dirt.) Another way to dry a wound is to change it more frequently so the moisture in the covering isn't held against the skin. I reckon this photo of you and the kids (taken on an angle) is the absolute best on the whole website. I love it!! !